My name is Margot Ensink. I live in The Netherlands in IJmuiden. 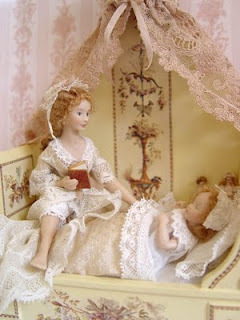 I am a miniature doll dresser since 2000.I do not cast and pour the dolls myself, but buy doll-kits and with permission of the maker, dress them and sell them. I use old and new materials of fine quality. I use patterns, but most of the time i alter them. 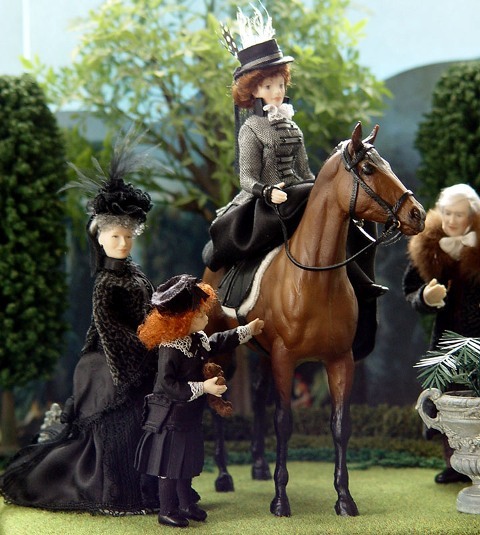 I sell my dolls at dollshouse fairs in The Netherlands and Spain and through my website www.labellebrigante.nl. My fascination with a world in miniature started with my fathers train hobby . Also on holidays he would take us to museums and beautiful historical and magical places. I get my inspiaration from books, movies, paintings, museums, visiting old houses, vintage textiles and old laces. 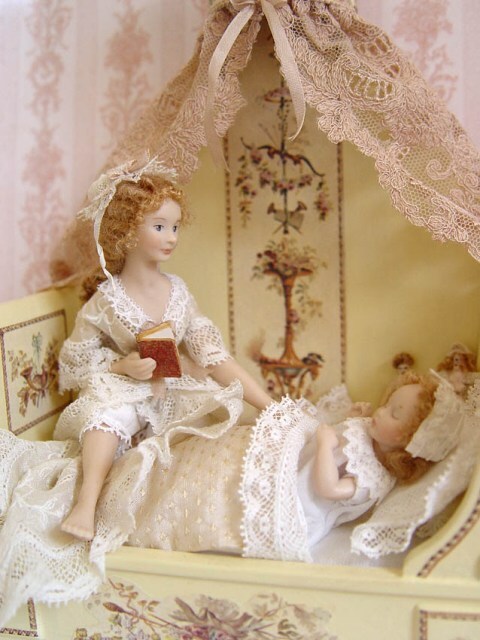 My father has always been highly supportive, he bought me my first Lundby dollhouse.He built me a dollhouse from a Honeychurch kit, and from his travels never failed to bring me tiny presents. As i love horses and riding them, i am fascinated by 18th century highway men. The name of my tiny business: La Belle Brigante, means something like the beautiful highway girl in italian and french mixed. Margot, tus trabajos son fantasticos y yo tengo la suerte de tener uno de ellos y espero que no sea el ultimo.